Candy Evans is one of the nation’s leading real estate reporters, bloggers and consultants. She reports on Dallas real estate for WFAA-TV’s Daybreak with Ron Corning, and is frequently called as a real estate expert by other Dallas media. She is also a real-estate editor for CultureMap Dallas. She even has her own web-based Real estate show called, The Party Line. Candy has written for AOL Real Estate, and is a guest blogger for Joel Kotkin’s The New Geography, Inman Real Estate News plus a host of national sites. Candy was a longtime contributing editor to Dallas’ D Magazine and sister pubs, and in 2007 founded the wildly successful Dallas real estate blog, DallasDirt. That’s where she broke the news on where former president George W. Bush bought his Dallas home in 2008. She is the founder and publisher of an exciting platform of Dallas-based real estate sites including SecondShelters.com, devoted to the vacation home market, and her signature CandysDirt.com, everything you need to know about real estate in North Texas. And yes, we are still psyched about the GOLD! In 2013, CandysDirt.com was named Best Blog by the venerable National Association of Real Estate Editors, one of the nation’s oldest and most prestigious journalism associations, and the only association for journalists covering real estate, home and urban design. School just started, but it’s already time to start thinking about what we are going to do this winter. We love to offer you many options here on SecondShelters.com. One of those surely has to be Snowmass Village, Colorado. The renowned but homey winter playground and vibrant mountain community is just 8 miles from downtown Aspen. Proving more of a family-oriented vacation, Snowmass Ski Area consistently ranks as one of the best ski and snowboard hills in the world. In addition to unmatched natural beauty and more than 300 sunny days a year, Snowmass Ski Area offers guests 3,332 acres of multi-level terrain and boasts the second largest vertical drop in the United States. A full 95% of the lodging is ski-in/ski-out, with 37 wonderful restaurants, numerous shops and boutiques, a bounty of activities, and a friendly, small town feel. The area is bursting with activity year ’round. And now, lots of new stuff coming up: the new Limelight Hotel and Residences, a new Plaza, Ice Rink, and several new eateries are set to open. The transformation that has occurred over the past year in Snowmass Base Village is pretty dramatic. From an unfinished concrete foundation to a completed Base Village at the foot of Snowmass Ski Area, the development has taken shape since construction was re-started in June 2017. This project, a partnership of Colorado-based East West Partners, Aspen Skiing Company (ASC) and KSL Capital, is a $600 million, 10-year venture that represents the largest ski resort development project currently underway in North America. To celebrate, Snowmass Base Village will host a community-wide grand opening on Sat., Dec. 15, 2018. “Every iconic destination needs a central place that connects people with fun activities and amenities to foster memorable moments,” says Harry Frampton, East West Partners founder and chairman. “Base Village is destined to be that place for Snowmass. We see a lot of fabulous homes, but few grab our attention like a Pottsboro property that just hit the market, located about an hour north of Dallas. This is a perfect weekend house if we ever saw one! The barndominium at 192 McClain Ln. is a sight to behold, an enchanting and unusual house made to look like a rustic wood barn with lots of high-end features for the discerning buyer. It has five bedrooms, four full bathrooms, two half baths, and 5,293 square feet on two stories, sitting on 10 acres close to the Texas-Oklahoma border. Located two miles from the shores of Lake Texoma, this residence was built as a vacation home by DFW residents looking to create a gathering spot for four adult children, grandchildren, and family friends alike. Read all about it and see the incredible photos over on CandysDirt.com! I’ve found an exceptional equestrian property sitting on almost 10 acres on the shores of Lake Ray Roberts, about an hour north of Dallas. 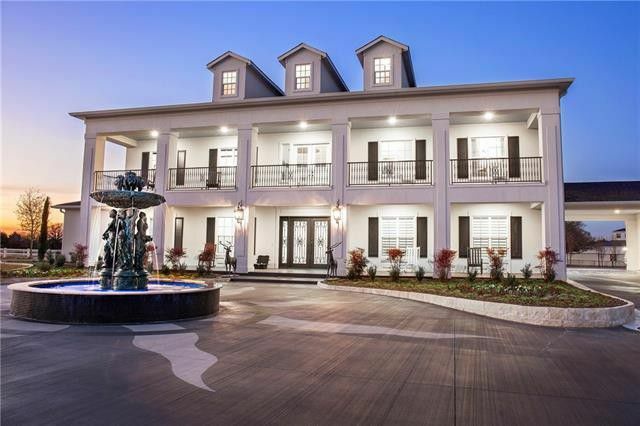 The expansive home at 7621 Sierra Lane in Pilot Point is a true luxury horse estate with a gorgeous custom home. Its Southern-style exterior leads to a high-end transitional interior with 20,437 square feet. You’ve got to see this in person to truly appreciate how unusual it is for our North Texas market. This estate has six bedrooms (including two masters), five full bathrooms, four half baths, four living areas, two dining areas, on three stories with an elevator and a gated entrance and guest quarters, built in 2015. Can I give you a tour? With the Republican convention going on this week, New Jersey governor Chris Christie is probably downing the Xanax. Maybe an extra dose. First of all, he did not get anointed as Donald Trump’s running mate. Which may or may not be a bad thing. But worse, his appointee to lead the Port Authority of New York and New Jersey, and his former AG, pleaded guilty to a bribery charge recently, admitting that he schemed with a lobbyist to delay approvals on a project just to pressure United Airlines to retain and re-launch a money-losing flight to South Carolina because of, are you ready? His vacation home. In Aiken, South Carolina. The vacation home market is estimated to be at $100 billion worldwide. In New Orleans at NAREE this month, I gathered five top vacation home experts, including Bill Furlong of HomeAway, Jackie Doak of Dart Enterprises Ltd., the developer ofCamana Bay on Grand Cayman Island, Hunter Harman, Broker/Owner of Berkshire Hathaway HomeServices Beach Properties of Florida, Tina Necrason of Montage Hotels & Resorts, and Tyler Niess of Crescent Communities. Learn from the experts on what is hot in the vacation home market, and see the whole panel discussion from the National Association of Real Estate Editors 50th conference, after the jump!